Carvoeiro, Algarve Portugal is a picturesque and traditional Portuguese resort town, situated along a beautiful coastline of golden beaches and dramatic natural scenery. Carvoeiro is a great destination for visitors who are wanting a calm and relaxed vacation, in a quaint and charming town. The majority of tourists visit Carvoeiro solely for a relaxed beach holiday, but there is a surprising amount to see and do within the surrounding region. This includes historic towns to discover, challenging hiking trails, exciting boat tours or the thrill of the region’s theme and water parks. Carvoeiro Algarve Portugal is very popular for family vacations with a large choice of accommodations and with plenty to do in a compact area around the town center. Water sports are available at the beach for those who playing in the water and a couple of diving schools if you prefer to be under the water. The local fishermen also make use of their boats during the day to offer visitors the chance to take boat trips around the coastline and to see the caves. The cliff tops around Carvoeiro offer plenty of walking trails and with great views. You can also check out the ‘algares’ which are holes in the cliff where the sea has eaten it away from underneath. On the cliff above Carvoeiro are the remains of the walls of the Fort of Senhora da Conceição dating from the 17th century, inside which is the hermitage of Nossa Senhora da Encarnação. You can also take a trip to Silves with it’s Moorish castle and riverside walks. A walk around the castle walls allows you to have a bird’s eye view of the town and surrounding countryside and there are lots of pavement cafés to stop for a cool drink afterwards. Carvoeiro Algarve Portugal has long hot summers, pleasant springs and autumns, and unpredictable winters that have an equal number of grey days as sunny days. The height of the summer season is during the months of July and August. June and September are as equally busy with vacationers who do not have children. If you are visiting during the peak season, it is essential to pre-book accommodation and flights as they will sell out. The autumn and spring months provide an excellent time to discover Carvoeiro Algarve. The weather is bright and sunny, but without the summer time crowds. During the winter months, Carvoeiro closes down and will feel very quiet, but a small selection of restaurants and bars will remain open. During the winter it is better to visit the larger resort towns, which have a permanent population, such as Albufeira or Lagos. The main airport is the Faro airport, and is 60 km to Carvoeiro. Faro airport is a major international airport with flights covering the majority of Europe, and this includes all of the low-cost airlines. This means that if flights are booked far enough in-advance, there is a good chance of finding very cheap tickets to Algarve, even in the summer. It is advisable to book transfers from Faro airport to Carvoeiro as it is a comparatively long distance. The recommended option for transfer is by a private transfer, with the driver waiting for you at the airport. The most respected transfer company is Yellow Fish, and their transfer costs €49. To enter Portugal, you may need a Passport and/or a Visa, depending on the country you live in. Citizens from the European Community don’t need a Visa for entering Portugal. Portugal is also a signatory to the 1995 Schengen Agreement. Passports must be valid for up to six months and are required by all, except by European Union nationals and nationals of Iceland, Liechtenstein, Malta, Norway and Switzerland holding valid national ID cards. British, Australian, Canadian, American and Japanese nationals need a valid passport – and for those countries, visas are also required by all, and valid for up to 90 days. 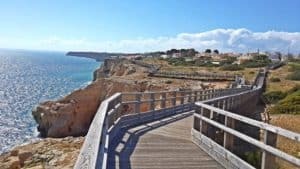 The Carvoeiro boardwalk is a picturesque cliff top walk that leads from the Nossa Senhora da Encarnação fort to the Algar Seco rock formation. This short walk is along an elevated wooden walkway, which skirts the top of the cliffs and offers wonderful views over the stunning coastline. A typical walk takes around 10 minutes but often takes much longer as the beautiful scenery is admired. The wooden path means that it is suitable for all and is perfect for less mobile visitors or families. The Algar Seco are a series of fascinating cliff formations that have been carved out of the limestone bedrock. The western side climbs down to a series of rock formations and honeycomb pitted strata. The most obvious feature is the limestone pinnacle, but more interestingly is the cave known as “A Boneca” (the doll). The short cave passage leads to a small chamber and the most famous viewpoint of Carvoeiro, two eroded arches with views out over the deep blues of the ocean. The “A Boneca” cave name originates from the seaside exterior, which resembles a doll, with the two cave arches forming the eyes of the doll. Praia da Marinha is an iconic beach near Lagoa, rated as one of the top ten beaches in the world. Praia da Marinha is known as one of the most beautiful beaches of the world. With it’s amazing cliff side, it is the favorite beach in the Algarve. Praia da Marinha is one of the top ten beaches in the world. Praia da Marina is calm and the water is really clear, almost transparent. 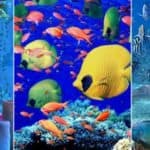 This makes it a popular destination for snorkeling, as it is possible to see many different kinds of marine species and fish underwater. Praia do Carvalho is a relatively quiet beach. There are no hotels or resorts directly on the beach. This makes this beach perfect for those who want to get away from the crowded beaches that you can find in other parts of the Algarve. The water is clean and the sea is calm. The area near Lagoa is famous for its impressive rock formations. Near Praia do Carvalho you will find a rock formation known as the window, which looks out over the beach. It is the result of many years of erosion. This pleasant stretch of sand is situated at the bottom of high, steep cliffs similar to those at Carvoeiro just along the coast. Fortunately there is a shallow valley leading down to the beach at the eastern end making access fairly easy (even by wheelchair). This is another Blue Flag beach so there are plenty of facilities for all the family including a seasonal lifeguard service. There is a cafe near the beach entrance along with toilets plus a hut selling ices and cold drinks during the summer. With the high cliffs offering shelter from the wind Vale de Centeanes beach is a haven for sun-worshippers. The cliffs themselves are a point of interest and worth a closer look where they have been eroded into unusual shapes. The snorkeling is also good around here. Boat trips by sea in easy boarding modern small boats, visiting breathtaking unique coastline caves, from Carvoeiro, through Benagil up to Praia da Marinha, considered most beautiful beaches in Europe. For more information call +351 965 041 785, or visit them on the web at Carvoeiro Caves. They are a small company offering Kayak Tours and on the Golden Coast of the Algarve (between Ferragudo and Carvoeiro) visiting some of the most spectacular caves and coastline of the region. 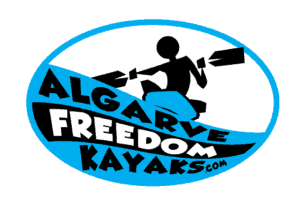 For more information call +351 912 902 646, or visit them on the web at Algarve Freedom Kayaks. Discover the Algarve that makes you feel good! Our website has info about all the nature tours. 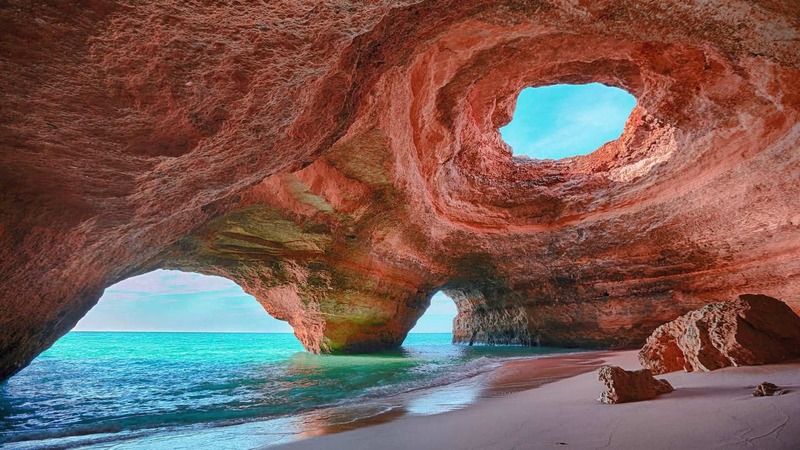 You can choose to swim into several unexplored caves while snorkeling to observe the underwater life or walk through beaches, villages or forests in Monchique, Alvor, Ferragudo & other traditional destinations. Small/Private groups, transport, photos, picnic & equipment included. 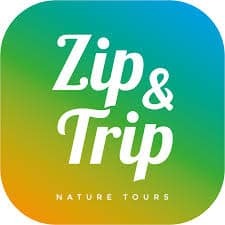 For more information call +351 929 259 348, or visit them on the web at Zip & Trip. Wildwatch Algarve is dolphin watching and more. They leave from Ferragudo. After the trip in our dolphin watching center, you get extra information, coffee, tea and cookies and they show you the video of the dolphin trip… They offer unique cave trips, kayak and snorkeling trips as well as sailing adventures. 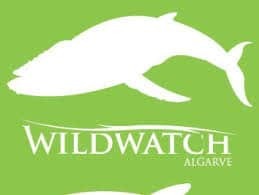 For more information call +351 914 256 887, or visit them on the web at Wildwatch Algarve. Guided Tours by Convertible Car and Scooter guided tours. Rent your Scooter and experience Italian timeless style, combined with modern 4 stroke engines! An unforgettable and environment-friendly mobility! Easy online booking and scooter delivery to your place! Cruise natural landscapes that only the Algarve can offer in which you will discover places, that is much more than sun and sand! 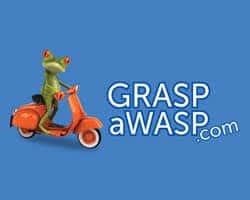 For more information call +351 912 979 234, or visit them on the web at GraspaWasp. A cosy restaurant with a relaxing ambience, L’Orange specialises in international and French-inspired cuisine created by Belgian chef patron Jan Mortier, complemented by the delicious homemade desserts made by wife Karin. The interior is pleasantly decorated, whilst outside, a pretty terrace is perfect for al fresco dining. L’Orange is located just outside Carvoeiro near the Carvoeiro Hotel. For more information call +351 282 357 297, or visit them on the web at L´Orange. An attractive trattoria-style restaurant at the top of Estrada do Farol, Primavera is under the ownership of Domingos, formerly of Villa Medici. Serving Italian/Mediterranean cuisine, the restaurant has a lovely ambiance and features a stylish interior décor, as well as a large outdoor area that’s ideal for the summer months. For more information call +351 282 358 017, or visit them on the web at Primavera. Delicious, quality steaks, rack of lamb and daily fish and seafood specials are served in this upscale bar and grill with smart interiors and outdoor dining on the ground floor and the new addition of the elegant upstairs lounge on the terrace. Located on Estrada do Farol, the restaurant’s star attraction is the US Black Angus beef, including an excellent T-bone cooked on the charcoal grill/oven. Lunch and dinner served indoors or on the bottom terrace and burgers on the upstairs terrace. Don’t miss the very popular Sunday Brunch at €15 with free flowing mimosas. For more information call +351 962 708 596, or visit them on the web at The Wolf. Creative cooking, excellent service, a charming ambiance and value for money make Pimenta Preta one of the most appealing fine dining experiences in the Carvoeiro area. New dishes from around the world, created by the chef ensure customers are always in for a surprise, whilst the quality of the food is matched by an equally impressive wine list compiled by the owner Nuno Diogo. Specializing in European classics and Asian cuisine. For more information call +351 282 350 281, or visit them on the web at Pimenta Preta. One of Carvoeiro’s best-known restaurants is run by Frank and Cristina who have completely refurbished Casa Algarvia, with terracotta walls, a modern bar area and a brand new kitchen breathing new life into the establishment. The menu features Portuguese favorites, from fresh fish to enticing meat options, as well as specialties such as fish cataplana and pork cataplana with clams. For more information call +351 968 663 568, or visit them on the web at Casa Algarvia. Located in one of the best locations in Carvoeiro, Boneca Bar is the perfect place to sit back and while away the time. Set within the cliffs of Algar Seco, this restaurant and bar serves fresh fish and a selection of meat, complemented by a carefully put together wine list. A family-run establishment, there is also a range of cocktails and sangria if you simply want a drink whilst you enjoy the surroundings. For more information call +351 282 358 391, or visit them on the web at Boneca Bar. 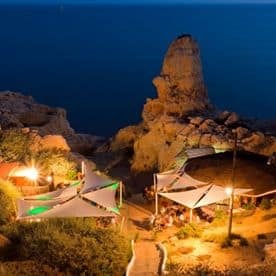 This Cuban inspired cocktail Bar in pretty Carvoeiro, is a great place to meet friends in the evening. With well priced cocktails, good bar snacks (chili beef burritos with tortillas) and inviting window seats to install yourself in against a backdrop of house music. For more information call +351 916 407 988, or visit them on TripAdvisor at Bar Havana. If you want to dance on the beach with the sand between your toes, this is the place for you. Caniço is a bar with a difference, built between the cliffs by a lovely cove and reached by an elevator from the cliff tops. During the regular live music and party nights, a DJ sets up on the sand (tide permitting) and you can dance till (almost) dawn. 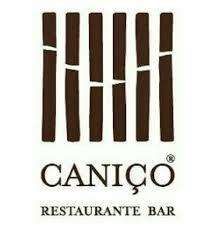 For more information call +351 282 458 503, or visit them on the web at Canico. This highly popular Beach Bar now runs right along the Sea’s edge with the Marina. It works as a whole day destination with a pool, sun loungers and food. In high season there is an entrance fee (7.50 euros) to get in and a string of musical events are held in the evening. 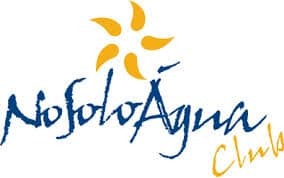 For more information call +351 910 789 991, or visit them on the web at No Solo Agua. This is an elegant place with great live music on Fridays and Saturdays, ranging across the whole blues/jazz spectrum. The atmosphere is warm and welcoming. For more information call +351 914 923 883, or visit them on the web at Stevie Ray’s Blues Jazz Bar. Four Seasons Country Club with its unique, friendly, relaxing atmosphere appeals to all ages, and it is not hard to see why. Whether one is looking for a sporty, family, leisure or relaxing holiday our well-appointed villas are set in beautifully landscaped gardens. The magnificent clubhouse and the extensive range of facilities make this the ideal choice for whatever type of holiday you choose. Ninety-six one and two bedroom luxury villas and apartments set within 17 acres of private gardens on the prestigious Quinta do Lago estate. A wide range of sport and leisure activities are available. Our restaurant, As Velas, is open daily all day, serving guests and members with fresh seasonal produce whilst our bar and lounge serves drinks and snacks throughout the day, and guests can enjoy live music four nights of the week. For more information, pricing, or to reserve your room, visit Four Seasons Country Club. Their accommodations comes in various shapes and sizes, from chic, sea-inspired rooms and suites with ocean-view terraces to spacious whitewashed villas with private pools. All are located within their oceanfront clifftop grounds amid 54 acres of subtropical gardens. Each type comes with standout features, whether a rooftop terrace or an exquisite Portuguese tile mosaic. No matter which room category is chosen, guests can expect a sophisticated, refined air of luxury and superb views of the flower-filled parkland or Algarve coastline, as well as modern conveniences such as Bluetooth speakers, LCD TVs and complimentary Wi-Fi access, among other features. For more information, pricing, or to reserve your room, visit Vila Vita Parc Resort & Spa. Vale d’Oliveiras Quinta Resort & Spa is an elegant 5 star resort conveniently located between Carvoeiro and Ferragudo, in the Algarve. This hidden paradise is just a few minutes drive from some of the finest beaches and golf courses in Europe! It is an all year round destination, ideal for family holidays, golf breaks and group travel. The resort comprises 22 rooms, 2 suites and 80 apartments as well as a large choice of leisure and well being facilities, a Mediterranean restaurant and two bars. For more information, pricing, or to reserve your room, visit Vale D’Oliveiras Quinta Resort & Spa. Built in 2010, this air-conditioned hotel is a luxury resort with 85 luxurious suites and villas surrounded by lush gardens, lakes and streams. Guests are welcomed into a lobby with 24-hour reception and check-out service. Facilities include a hotel safe, cloakroom, games room, children’s playground, kids’ club, café and restaurant. WLAN Internet access, room service, a laundry service (for an additional fee), a car park and a bicycle hire service are also available. For more information, pricing, or to reserve your room, visit Vale da Lapa. Overlooking the Atlantic Ocean on the Vale Covo cliffside, this fully-refurbished, family-friendly 5 star hotel in Carvoeiro, Portugal ensures a spectacular holiday whether you’re seeking business or pleasure. After a comprehensive 5 month remodeling project, our hotel is setting a new standard for luxury among Algarve resorts, with 248 stunningly refurbished bedrooms, suites with balconies and new Family Rooms for larger groups. Take advantage of impeccable facilities including celebrity-chef standard restaurants, Tivoli Spa, a first-rate fitness area and more than 1,300 square meters of impressive event space, while still possessing the same unstinting enthusiasm and warm service that has made the Tivoli Carvoeiro a landmark hotel for a quarter of a century. For more information, pricing, or to reserve your room, visit Tivoli Carvoeiro. Awesome! Love the cliff formations and the boardwalk. I love hiking and walking–and there is no better way to do it than on a scenic byway. Walking in the neighborhood–what most of us has to do when taking walks–is so drab; but this is spectacular! Love the map and the cute “We’re here” showing the location. Nice touch. Once again I want to go there. Yes, I love to walk and hike as well. What could be more beautiful than a walk/hike in Carvoeiro? Not much in my book, it is absolutely breathtaking! 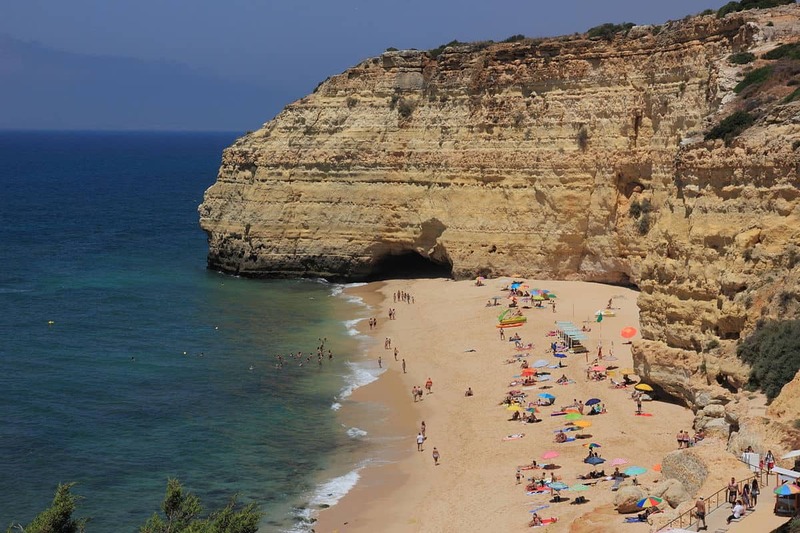 Glad you enjoyed reading about Carvoeiro Algarve Portugal! Wow!! It looks like a dream place. 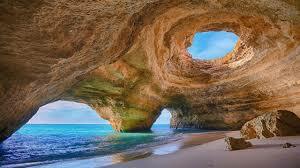 I have never been to Carvoeiro Algarve Portugal before but I hear it’s amazing there!! And you mentioned some great things to do, the Carvoeiro Caves sounds beautiful, the bars and the restaurants look amazing and so fun!! Amazing and fun place is right 🙂 One of those places to add to your bucket list to check off when you go. Thanks for visiting Beach Travel Destinations and learning about Carvoeiro Algarve Portugal! This is absolutely beautiful! 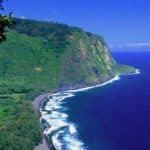 My family and I have been planning a trip to Portugal for a few years and we were thinking the Azores but I have to say after this post, I might reconsider. Those caves look stunning. And you’ve already got good recommendations on places to eat. We are still in the planning stage but I will bring this one to the table. You really should change their minds. 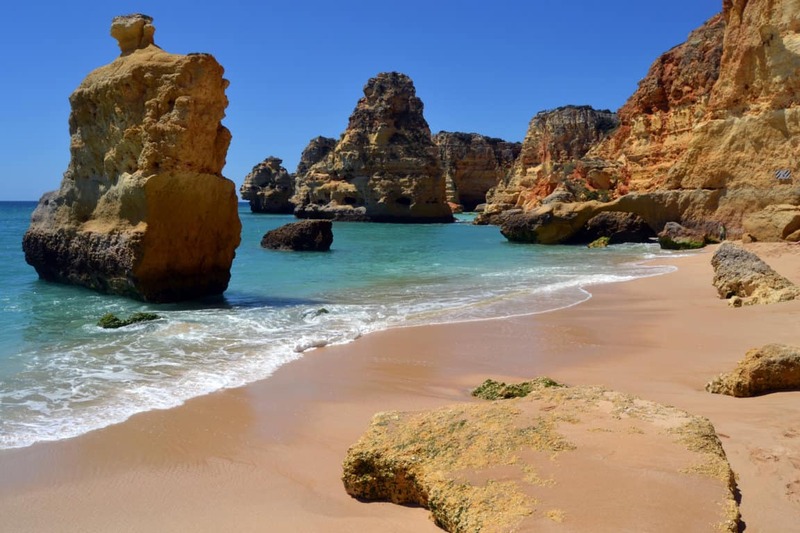 The whole Algarve area of Portugal is stunningly beautiful and a wonderful beach destination. 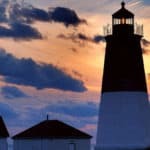 If you have any questions, or need help with planning (even if you are heading to the Azores), I would be glad to help! Hi Daniella, and my actual recommendation for visiting here would be two weeks. I think it is plenty of time to see all the highlights that Carvoeiro Algarve Portugal has to offer. 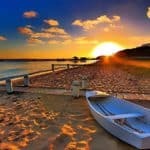 I suppose, it also depends on how much time you want to spend at the various beautiful attractions and beaches. If you want to really enjoy and take your time, relax, see it all, then I would possibly consider 3 weeks. Thanks for visiting! Wow, what a beach! I like the rock formations that are near the beaches. You feature some nice 5 star hotels and some restaurants that aren’t all that expensive, which is great for the traveler. Plenty to do here in Portugal. 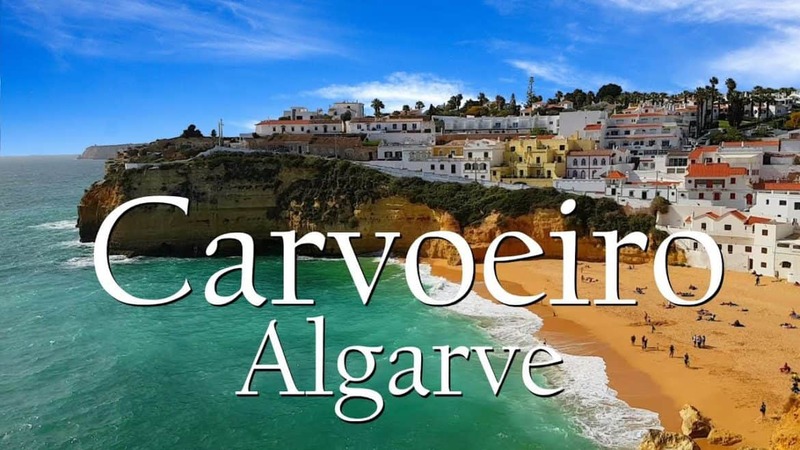 I bet a lot of Europeans come to Carvoeiro Algarve, Portugal! It looks like a top place to visit if you love beaches like my wife and I do. Yes, lots of Europeans visit Portugal for sure. I have most of my family in Germany, and they all visit here during their winter months as Germany does tend to get chilly (well pretty darn cold in my opinion) in the winter. It is an amazing place not to be missed! Portuguese food is also amazing. I remember visiting a Portuguese restaurant when I lived in London and they had those custard tarts that Portugal is famous for (I forget their official name), but they are to die for. If you visit the Algarve you must try them. I might have to look up the name for the custard tarts and add that tip to my post 🙂 They do have amazing beaches, but nothing beats a visit to Algar Seco! And you are right, Portuguese food is amazing! Thanks for stopping by Stefanie. What a beautiful dream destination! I have never been to Carvoeiro Algarve Portugal before but it is on my bucket list now! The scenery and the area attractions are really breathtaking, especially the Algar Seco. Since I live in Europe, it is not that far away from where I live. I will definitely visit Carvoeiro Algarve Portugal as soon as I get the chance. Thanks for sharing this post Leahrae! Glad you enjoyed Ruya! It is definitely a place worth vacationing to. You are right that it is breathtakingly beautiful with so much to offer. Thanks for stopping by! 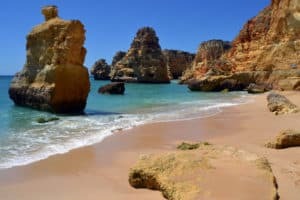 Wow, such a complete, thorough itinerary for Carvoeiro Algarve, Portugal! Atmospheric writing and images, compelling me to visit. Looks like a magazine and reads like a high quality reference. Are you a professional travel agent, but one who flies out to these destinations and wears out many pairs of shoes (and flip flops!) walking the walk and exploring them before you share your findings? It sure seems like it. I am not a professional travel agent, although in my earlier days I really thought that was what I wanted LOL. I do wear out a good amount of flip flops! I keep lots of them on hand 🙂 Thanks for visiting Beach Travel Destinations. Hey Leahrae, Again, Portugal is a place that I’ve never been to and of course it’s beautiful! There isn’t anything there I would not want to see and experience. 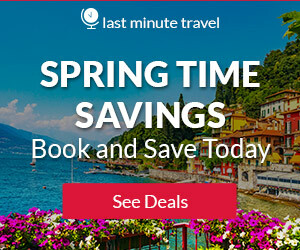 Is there a best time to visit? And considering how much there is to see and to, what do you recommend for a time period to go for? Is one week enough? Thanks for stopping by Rob. The best time is going to be July thru October. Of course, September and October will not be as hot, and maybe a tad less crowded. I really think that visiting Carvoeiro Algarve Portugal is a 2 week vacation. There are so many beautiful places here, that you just cannot experience in one week. Please let me know if you have any other questions. Wow! Great article. You have given complete insight about Carvoeiro Algarve. I feel desperate to visit this place. Good suggestions on the restaurants.Thanks for this wonderful post. Wow, you have listed the complete itinerary. I am more than eager to come to Algarve and I will definitely contact you for assistance with the hotel bookings. Going through more of your articles. Keep it coming. Other than that, the article was beautifully written yet very informative and accurate. 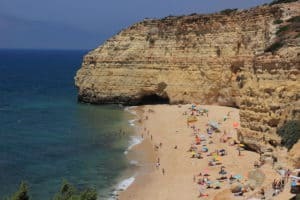 Algarve is definitely on my next-destinations list and I am really looking forward to visit it in the near future, and your article gave me hope, to be honest, as it does seem that I can afford it, while it is absolutely worth it. My questions is: Which is the preferred time of the year to visit Algarve? Hi Heku, really any time during July thru October is going to be wonderful. If you want to miss some of the crowds then stick with September and October. The hottest months will be July and August. I like hot, so it is all good for me. It is definitely worth it! Thanks for stopping by! You are welcome Joe, and glad you enjoyed reading about Carvoeiro Algarve Portugal. Yes, Algar Seco is a wonderfully beautiful spot in Algarve. 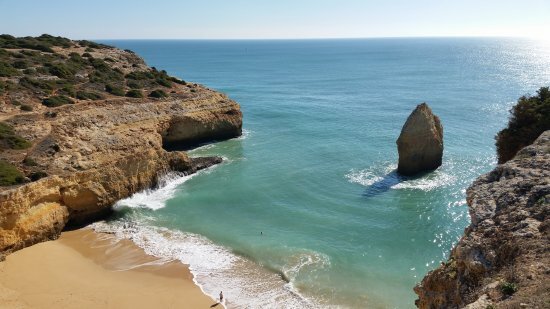 It is not to be missed for sure, as well as Praia da Marinha. Thanks for stopping by! Wow! Just wow. And I have to say – wow!This place looks really amazing.I really wanted to go there and I still want, of course. The thing is that when I was searching for tickets to Portugal they were pretty expensive from Bulgaria where I live. Then you do have to visit soon! If you need any help planning, I know I could find you the best deals. Just shoot me a message, and thanks for visiting Carvoeiro Algarve Portugal!